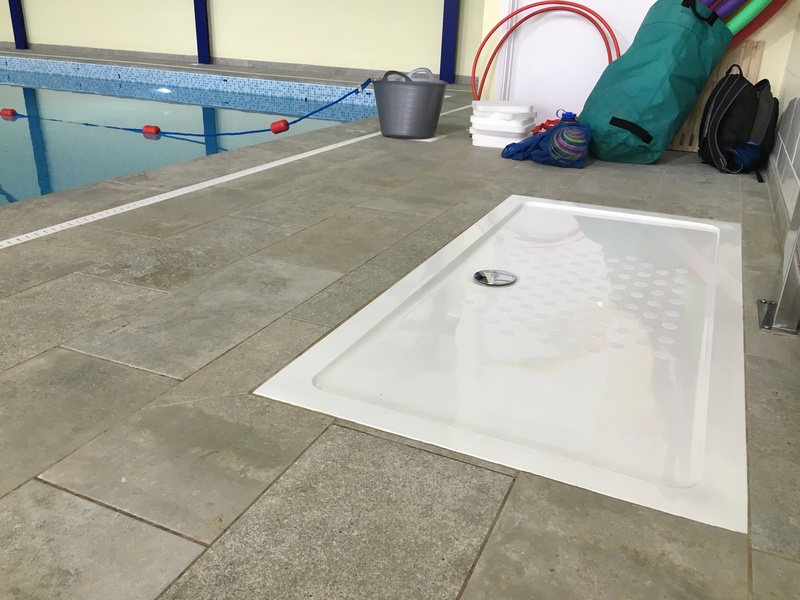 This week we were delighted to be able to help out the owners of a swimming pool in our local area of Devon who had a problematic slippery shower tray. The owner has just completed building a luxury swimming pool, hot tub and changing area as part of a holiday home complex. Unfortunately, the stylish poolside shower was pretty slippery and he was concerned about the safety of the pool users. The owner was keen to find an anti slip solution that didn’t ruin the look of his pool complex. He had already tried a wooden washboard style mat, but this had proved to be prone to sliding away on the slippery shower tray. He had rejected the idea of a bathmat as they are so hard to keep clean, especially in a pool environment. When I offered him some Anti Slip Bath Stickers to try he was intrigued and fit them the following day. As you can see from the picture they are very unobtrusive and he was able to cover a large area where people stand under the shower. Slippery Shower tray problem solved! Another customer is now ‘in the know’ and has been able to ensure appropriate care and attention has been paid to this important health and safety matter. Non Slip Bath have been providing Anti Slip Bath and Shower stickers to hotels, guest houses, campsites and spa complexes for over 10 years, as well as thousands of satisfied customers who also have the anti slip stickers in their own bathrooms.